Don't you just love the name? I think it's cute, however inaccurate it is. It's terribly inaccurate, actually. Firstly, I couldn't find the puppy, and secondly, where in the world is the purple?! Perhaps I had chosen a bottle with a wrong label (but I doubt it). Mine says VI407. 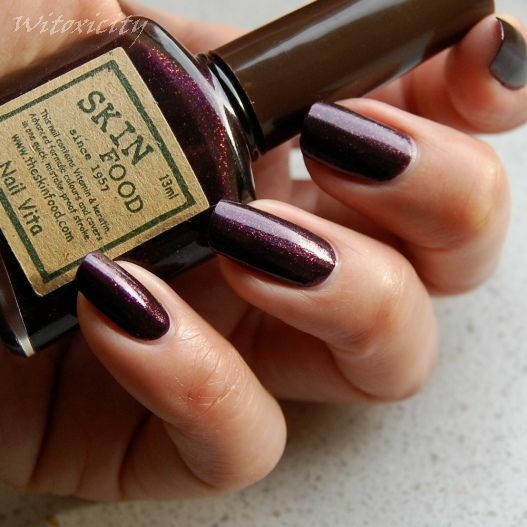 I checked the Skin Food website and it shows that VI407 has the name Puppy Purple. In real life, it looks burgundy. A beeeautiful burgundy, so dense with microglitters you'd wonder how they managed to squeeze them all in. 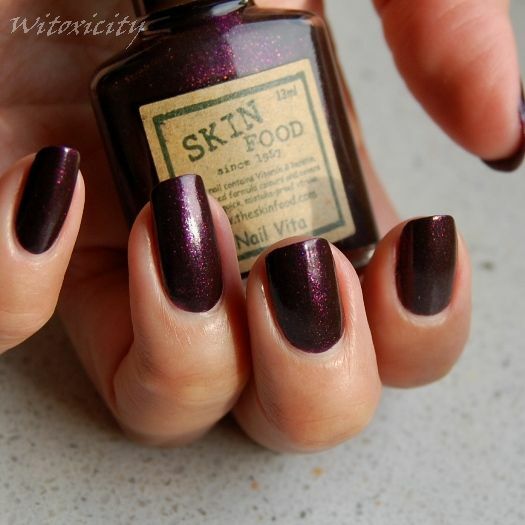 Just like the previous Skin Food nail polish I showed a few months ago, VI408 Violet Stone, the formula for Puppy Purple was thick, but I managed to apply the polish without resorting to using a thinner. This polish has an awful smell too, just like the other one. I had to keep my nose far away from the brush. However, I do find this one relatively hardier than Violet Stone. It's the end of Day 1 and I see no signs of chipping yet, not that this says anything that significant. Burgundy and microglitters make a perfect combination.......for me, at least. My heart feels so warm and fuzzy when I look at this polish. And look at it a lot I do. I quite enjoyed the pictures in this post, lovin' the angles you took! And that colour looks SO pretty. 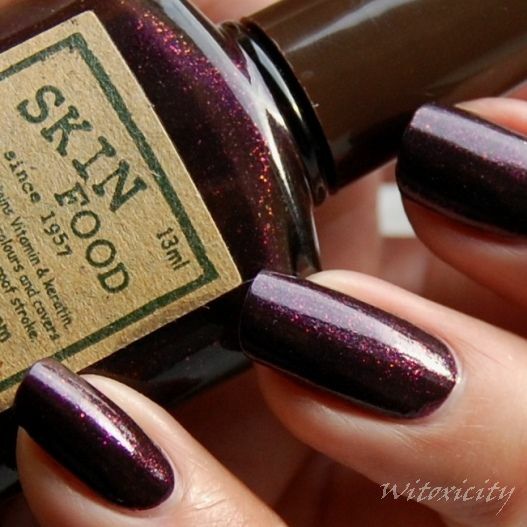 I swear I've seen a lot of polishes, but you cease to amaze me by showing more prettiful colours that are unique and distinct on their own. Oooh, that's luscious... I really love that! "I really like going here - your blog is 10"
It's the kinda color that makes me wanna sit on the couch under a blanket with a nice warm cup of hot chocolate, if that makes sense :P Warm and fuzzy indeed!